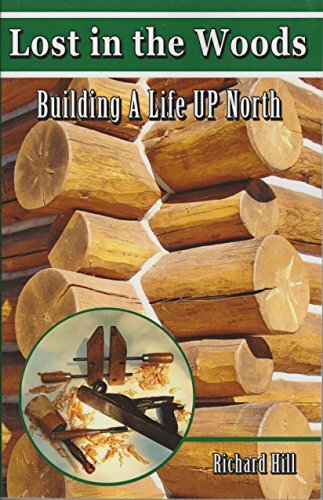 What first attracted me to this book was its title, “Lost in the Woods: Building a Life Up North.” Being from Michigan, I immediately connected with the words “up north” as everyone from this state has friends or family who go up north for getaways. This is the plan for author Richard Hill and his wife Judy – to rebuild their lives on the shores of Lake Superior in the Upper Peninsula of Michigan, a region where the couple grew up and have family. With a degree in art and experience in furniture making, Richard’s dream is to construct a custom log home. He soon realizes that the project presents unique challenges especially with the long winter months that are characteristic of the Upper Peninsula. His story tracks the process of construction from choosing a home designer and clearing the land, to completing unexpected details that would stretch over 20 years and require unlimited amounts of persistence. As previous business owners, Richard and Judy go into their project at full speed but learn along the way that slowing down can reveal the true benefits of the process and offer the most reward. There is no need to know about construction to understand Hill’s book. He provides a good glossary of building terms to help you navigate along the way. Plus, the story is interesting and not just a narrative of a house being built. For me, it was the philosophy behind the build that kept me intrigued. Hill learns some important life lessons: 1. Understand what you are getting into before you begin 2. Learn to accept imperfection. 3. Keep your sense of humor. When Richard asks his brother Fred to produce an account of all of the hours he assisted so that he can pay him for his time, Fred hands him a note that reads, “one jar of pickled eggs and a case of Guinness Stout,” knowing full well that Richard can never afford the endless hours his brother has willfully committed. This is a captivating tale of pursuing a dream. Hill is, after all, an artist who doesn’t get bogged down by the mechanical details. His outlook provides a psychological perspective that is intriguing and meaningful beyond the house building process. Hill’s deviation into stories of growing up in the small town of Sault Ste. Marie and working on a freighter in the great lakes provide depth and tenor to his memoir. What I enjoyed the most is his inclusion of personal diary passages from family and sub-contractors who are involved in the construction process. Many of the vignettes provide candid accounts that lend an authentic layer to Hill’s story. Richard Hill’s book is a multi-dimensional resource for log homebuilders or others interested in undertaking a home building project. “Lost in the Woods: Building a Life Up North” is part construction manual part adventure/travel/history book. It is a fun read that fulfills the author’s intention of shedding light on what to expect when you go after the dream of building your own home on a tight budget. Not only does the author discover that hindsight is 20-20, he comes to the conclusion that once achieved, perfection is not all that it is cracked up to be.